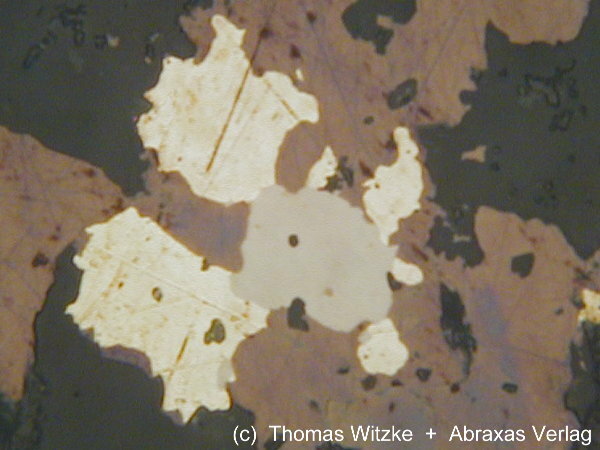 Comments: Light grayish grain of intimately intergrown isomertieite and arsenopalladinite (in the center of the picture), with pale yellow gold and brownish to violet bornite. Polished section (from microprobe analysis) in reflected light. Location: Noril'sk, Putoran Mts, Taymyrskiy Autonomous Okrug, Eastern-Siberian Region, Russia. Scale: Picture size 0.1 mm.